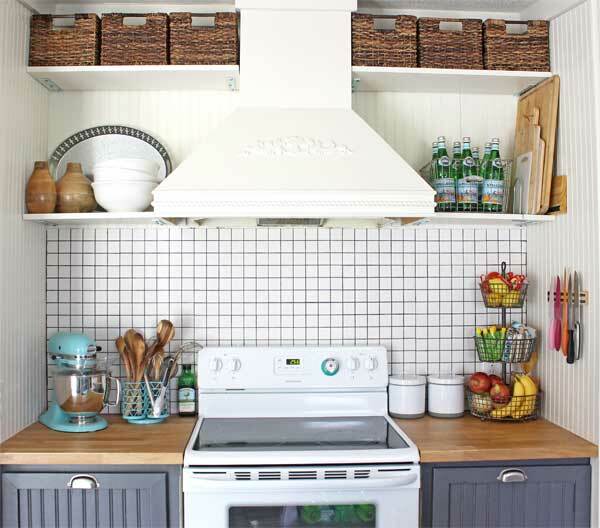 Creating more kitchen storage was at the top of my to do list during our kitchen makeover. Can you ever really have enough storage? Well, I’m here to tell you that yes, you can. I had so much left over space that I spread out our cramped dishes and filled up spaces with things that had been hidden away. 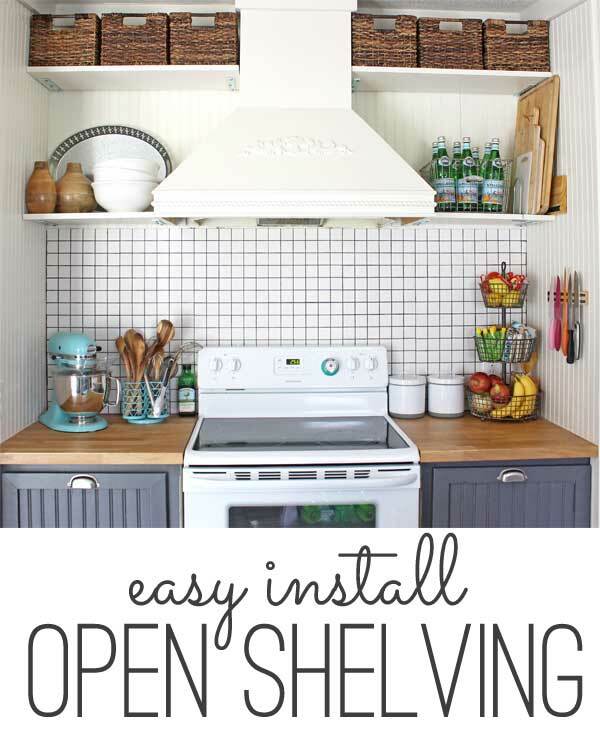 And that’s thanks to these easy open shelves! 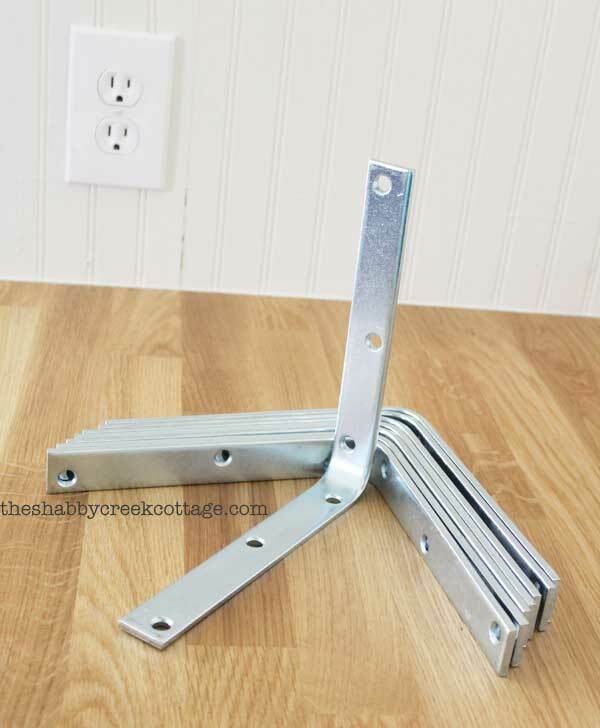 I’ve gotta admit, though – when I first looked at doing these shelves I was kind of blown away at how expensive brackets are – until I found a solution. These metal brackets were perfect to me – at around $4 each, it was a lot cheaper than the $20 plus ones I was finding everywhere. Oh – and the simple design was right up my alley. My husband thought I was nuts when I told him what I wanted – but these sturdy metal pieces were just what I had in mind. First I measured the pieces to be the length I needed, cut them out of regular 1×12 pine, sanded and painted them with two coats of the wall color (HGTV’s Porcelain by Sherwin Williams). Then I used the bracket as a guide, measuring in one inch and pre drilling the holes to put screws in. Once the screws were in, I held them up to the wall with a level (hence no photos) and used the backs of the metal pieces to hang them to the wall. For around $40, I created tons of storage in my kitchen to put our every day essentials on the bottom shelves and occasional, holiday things on the top. The whole process took less than an hour and was so easy that I did it all by myself – so ladies if you’ve been wanting to try a project this one is for you! Don’t have a saw to cut the wood? The lumber store will do it for you. 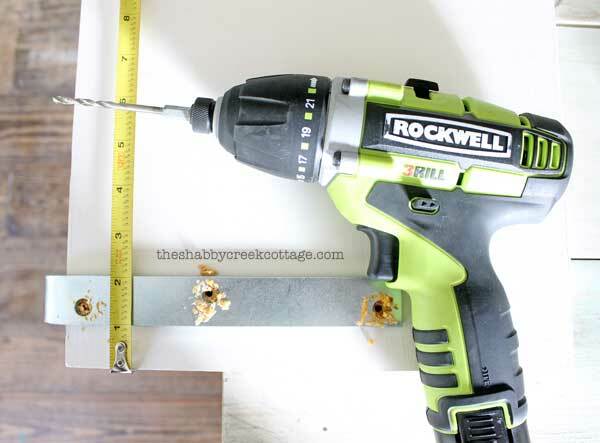 Really all you need is a drill and a level and you’re set to install your own storage! Could those brackets have been spray painted white to blend in more? Sure they can. Use paint for metal. LOVE EM! Did you have to find studs or just screw into drywall? This is a great idea! I need more shelving in my art studio and I am going to try this. Thank you! Your kitchen looks great! I love your style. If someone doesn’t have a level, there’s an app for that! I use mine all the time when I’m hanging things. This is cool. I like that I may actually be able to do it myself. Just wondering how much weight these brackets can hold? I don’t know for sure, but mine hold quite a bit of weight without issues.